As someone who has recently downsized, I had to get ruthless with many small appliances, pots and pans and accessories. If like me, you have a much smaller or compact kitchen; it can get hard to create meals in the same old way. A cooked breakfast can be hard to do in a small area, if you are frying bacon, eggs, toasting toast and making coffee. This will end up requiring frying pans, a stove, coffee maker and toaster. I was really excited to see this 3 in 1 breakfast station idea. If you simply can’t look at breakfast and are happy with a cup of coffee to get your day started, look closer, this is advertised as a breakfast maker but can be used for any other types of meals. The toaster oven side of things along can heat or toast all kinds of foods, and coffee is always welcome. I seriously wish I had one of these when I was living in a trailer while building our house. We had lots of electrical power but very tiny kitchen and stove, it was frustrating to create meals. 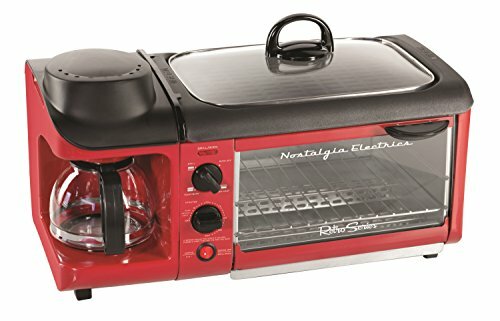 It has a non stick griddle, a 4 cup coffee maker, multi-function toaster over (perfect for reheating meat pies or anything you want not just toast!) glass griddle lid for the top while cooking your bacon and eggs. NOTE: You do need to make sure you have an electrical outlet that can power this as it is 1500watts, but most kitchens have split circuits for appliances, but worth checking out first. If you have a compact kitchen, you can get many under cabinet appliances to leave you counter room, but what if you could do everything on this unit? In a dorm room there is often no stove or oven and kids rely on small appliances to get them by. This would allow them to do everything. I personally love the idea of it all in one spot, where you can monitor it all at the same time. I don’t need stove burners going, the coffee pot and a toaster; it pretty much replaces the need for these. May not be the best idea for a huge family but if just one or two in the household and a small kitchen, this is a really cool idea. In one review the customer used the top to fry hamburgers and toasted buns in the little toaster oven. You don’t even need separate pans and it is easy to clean with the non stick griddle. This unit doesn’t have the griddle on top and is not as wide. It also has the retro feel and color. It will at least look good sitting on the counter or table. It does have the toaster oven and coffee maker so you can set it on the table and watch your toast cook while the coffee is brewing. If your breakfast of choice is the drive thru for an egg McMuffin, check out this idea. 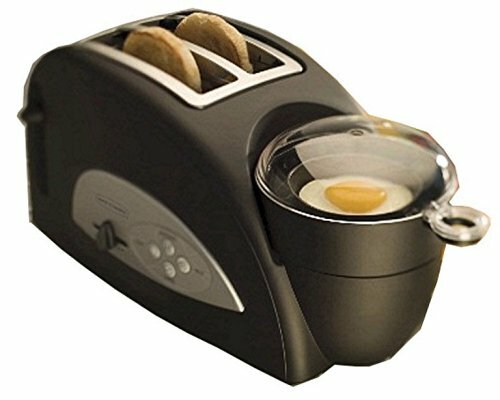 This is a toaster and egg poacher all in one. I love poached eggs but always made them in a pot of water on the stove, not something you can do when in a hurry in the morning. But this unit not only has wide slots for the English muffin, it has an attached egg poacher for cooking your eggs and even heating up your bacon or sausage. You can make your sandwich all in one spot and the egg is the perfect shape to fit on the muffin. No draining or wet English muffins. This is a 3 in 1 breakfast station that cooks your egg, warms your meat and toasts your breads including croissants and bagels. 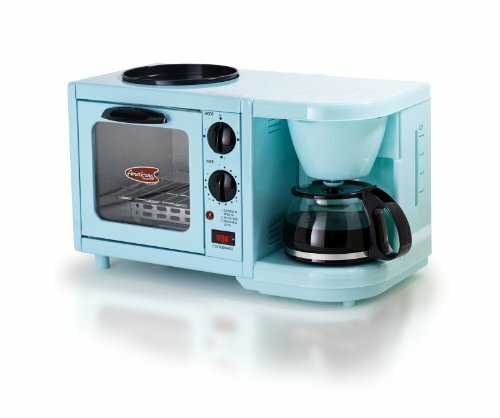 You could set this all to be cooking while putting on your shoes and grabbing your to go coffee, and it will be ready so that you can skip the drive thru. There are so many creative ways to be functional in a small or tiny kitchen. It all depends on your needs and food habits as to which tiny appliances you should invest in to make life easier. There are many under cabinet small appliances that will keep your counter top clear and use the space between the upper cabinets and the counter. This is an awesome idea, but there are some appliances that still need some counter space. If you have a small kitchen, you need the appliances you do have to work double time or even triple time. In other words, you need them to be able to do more than one task at a time so that you don’t have to own too many. The breakfast station is a good option for anyone who doesn’t have a large stove, or is happy with a small toaster oven, toaster and coffee maker all in one. These appliances meet the criteria of being able to multi-function and not take up huge space. Retro Styling makes them look good too. They don’t look cumbersome. If you can quickly make your own breakfast, this could break you out of the “drive-thru” habit and save a few bucks, especially with the unit that poaches eggs, warms bacon or sausage and cooks English muffins all in 4 minutes. This would be a great gift to yourself or anyone else who struggles with a small space!